Do you want a home that makes you say WOW!? Then lets make an appointment and design a home just for you! Hi there, my name is Kelvin and I have been designing homes for over eighteen years, accumulating over 840 different designs for private homes, commercial buildings, retirement homes, multi-unit developments, spec. houses, alterations and even garages. I believe the design process should be fun and exciting. It is for me so it should be for you aswell. I am proud to say that the majority of my work has been from repeat custom and referrals. 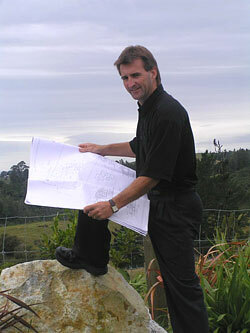 My main area is the Tauranga & Whakatane region but I have worked on projects from Nelson to Kerikeri. No job is too big or too small, having designed homes with a build cost of 1.2 million dollars and even a private BBQ/pool area worth $125,000. My designs are all based on common sense. With a budget allocated, I use a unique design procedure based on ground contours, availability of the sun light for warmth, sheltered areas from the wind, and of course, the view. Combining these features with the character and style you like, together we'll build a design for a home you'll love. My belief when designing homes is that the home must be practical with usable spaces but must also look good. If a style is desired such as French, Colonnial or Mediterranean, I like to carry that style throughout the whole design to create a theme for your home. The quality of the designs and working drawings are such that I won't draw it if I can't explain to the builder how to build it. Thanks to this attitude I can proudly put my name on all of my work and can guarantee the drawings for approval of building consents. I am always keen to get into new designs so please feel free to contact me if you have any queries regarding the design service, project management system, or if you just want to throw some ideas around. You can find my contact details below or on the contact page.